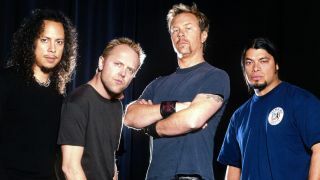 Metallica have streamed the remastered version of classic track The Four Horsemen, taken from the upcoming deluxe edition of debut album Kill ‘Em All. The 1983 record and its follow-up, Ride The Lighting, are to be launched in limited-edition multi-disc box sets on April 15, to tie in with Record Store Day. The packs also include pictures from the band’s personal archives, along with detailed articles written by people who witnessed the albums being made. Meanwhile, Metallica have revealed the cover art for the live album they recorded at the Bataclan in Paris in 2003. It’s also released on Record Store Day, with proceeds to be donated to the victims of the terrorist massacre at the venue in November.